Gigatribe API is a collection of HTTP GET/POST services exposing Gigatribe functions to developers. The purpose is to help developers build their Gigatribe applications with less effort. The applications will be able to performe inviting users, joining tribes, reading contacts information, etc, outside the desktop version of Gigatribe software, for example, in a web forum. You will get your response in JSON format. We plan to support other formats in the near future. In order to begin with Gigatribe APIs, it would be better that you understand some basic concepts and development tools. However, we will lead you through the process in the tutorial if you’re just beginning exploring the web. 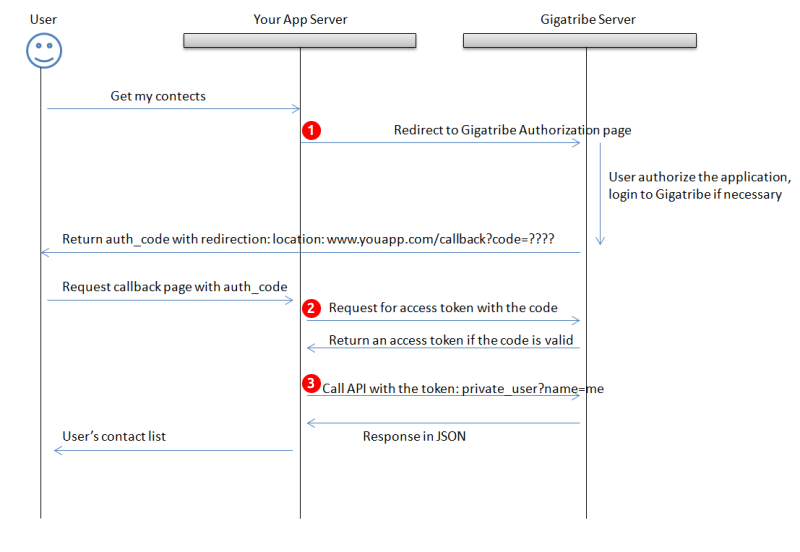 Gigatribe API is protected by an authorization protocol called OAuth 2.0. In order to user our API, you as a developer have to register your application on our developer website and then use the client id and secret given to gain required authorization for the real user of your application. The detail is discussed below. Calling an API is a not very complex. However, in order to understand the process, we must introduce the OAuth protocol. To call an API, all you need is an access token. But in order to obtain an access token, you first have to let the user authorize your application to use his/her personal data. Thus the process begins with the user being redirected to Gigatribe authorization page. The user will be required to login with his/her username and password to proceed. Then the authorize button will show up. If the user clicks on the authorize button, the user's web browser will be redirected to the callback page of the application site which is registered when you create and register your application on create application page. To become an application developer for Gigatribe, first go to create application page to register your application. Fill in the form with the application name, the callback URL (optional) and a brief introduction (optional). Pay attention to the callback URL, because all of your further requests will be compared to this adress. Be sure to provide the right address domain, don't forget the http:// or https:// part, nor the www part or the sub-domain. So you should enter some address like https://subdomain.yourapp.com/callback. But you can always change your application settings in the app detail page. On successful registration, you will see a table of your application information, including the client id which is the ID of your app, the client secret which is very inportant and should be kept secretly, and the information you just entered. Don't forget to manage the applications you created at My Apps. You can change their settings anytime, unless you could never change their client id and secret. These two values are generated by the system.